Moses led the Israelites out of Egypt with great victory. When the Israelites leave Egypt, they plundered the Egyptians of their silver and gold. After Moses and the Israelites had left Egypt, Pharaoh suddenly hold back. Pharaoh took his soldier with him and chased after the Israelites. When Pharaoh caught up with the Israelites, they were camped before the Red Sea. The Israelites were afraid that the Egyptians attack them and they complained to Moses. 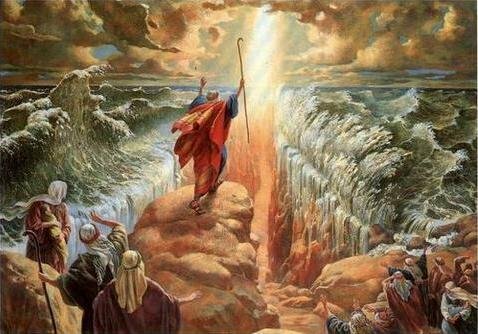 Moses stretched out his staff over the Red Sea and Red Sea parted into two walls of waters on the left and right. It forms a passage of dry ground for the Israelites to cross to the other side. And the Israelites hurry across the passage to the other side. An angel of God who went with the Israelites sent darkness to the Egyptians on one side but light to the Israelites. When the morning came, the Lord saw the Egyptians were pursuing the Israelites and he made them drive with difficulty by taking off the wheels of their chariots. The Egyptians pursued the Israelites into the midst of the sea. After all the Israelites had safely crossed the sea to the other side, Moses stretched his hand over the Red Sea again. The water of the sea covered the dry ground and drowned all the soldiers of Pharaoh.